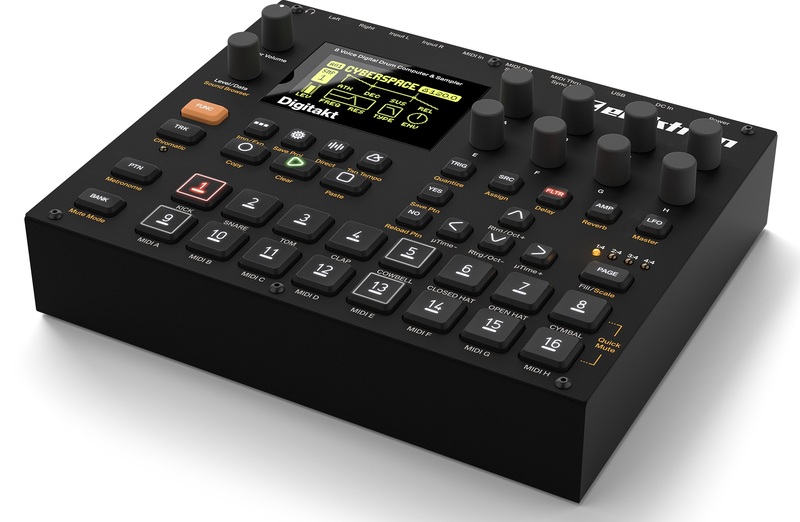 Elektron is releasing Digitakt, an impressive drum machine and sampler. The product has its debut on NAMM 2017, and now it’s finally being released on Superbooth 17. Digitakt comes in a compact, rugged and durable chassis, and it has eight internal audio tracks, where it’s possible to route any audio sampler and eight dedicated MIDI tracks, making it possible to control external gear. The machine comes with an ultra crisp OLED screen, so all information is displayed in a clean and user-friendly interface. The eight encoders at the right will control the respective parameter in the screen. 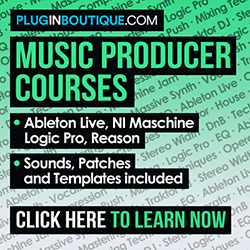 There are sixteen highly responsive pads; the first eight are used to store drum samples while the bottom eight will control MIDI tracks. Digitakt is also an 8-track drum sampler, so the user can sample from external sources through two available audio inputs. The USB port is also available so that the user can upload samples as well. The equipment comes with a 1GB drive to storage samples, and it has 64MB of sample memory. One of the greatest sample features is the chromatic mode: by activating it, each sample will be automatically transposed to be played in an octave span through the pads. So, Digitakt is not only a drum machine but also a powerful synthesizer. There are built-in reverb and delay send effects, as well as a drive effect which will help to design the sound. The machine also has a filter section, with high pass and low pass filters available. 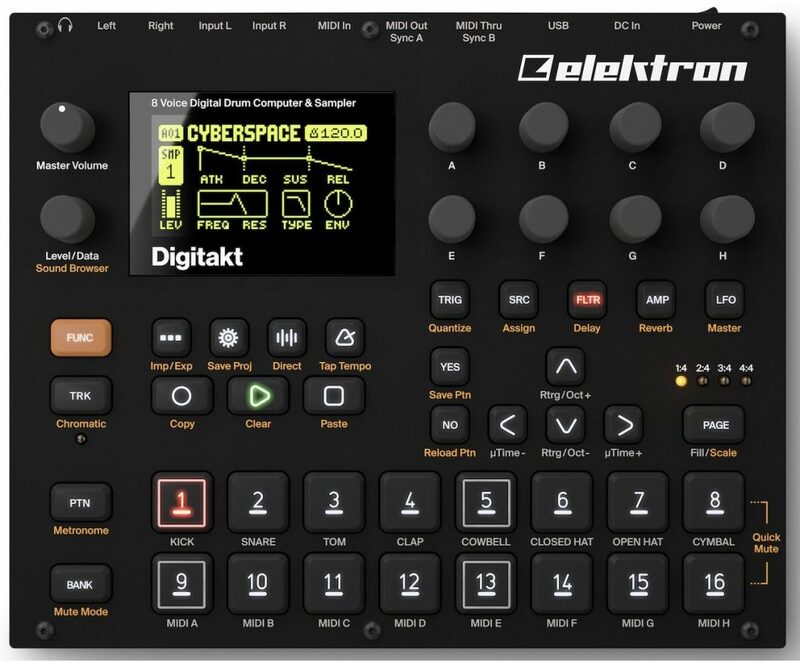 Digitakt comes with Overbridge, a software suite from Elektron, offering nice tools when using the machine connected to a computer. The unit comes pre-loaded with several samples, such as electronic and acoustic drums, synths, FX and percussion. The rear panel has a power supply switch, USB port, 5-pin MIDI In/Out/Thru jacks, left and right audio inputs, left and right audio outputs, and a headphones jack.